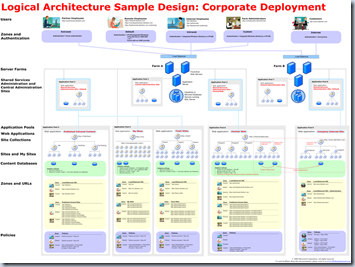 What makes a successful SharePoint deployment? What items do you need to have checked off to try to avoid any major obstacles in the near future? How do you ensure that you get a good ROI? How come in “Back to the Future II” when Biff brings the Delorian back to the future after he gives himself the sports history book, it takes him to the future where he’s not rich and powerful when it should have taken him to the alternate future? Although there are WAY more than 10 requirements to a successful deployment I thought I’d pull out what I consider to be ten of the biggest. If you haven’t addressed these items it’s going to bite you at some point. I’m NOT going to go into too much detail in each of these points. You could do entire series on the do’s and don’ts for each requirement. My hope is that you have either already addressed these requirements or maybe this post will help you identify where you need to invest more time and research. Take this as a springboard for discussion and research, not the defacto post on the subject. I can’t even begin to do it justice. I’m just here to stir the pot. What the heck is SharePoint? Why do I want SharePoint? Do I need it? Why do I ask more questions in my blog than I answer? If you don’t understand what SharePoint is or what it does you will not use it properly or anywhere near its full potential. SharePoint is NOT just a file share and place for team sites. Learn what it is and what it can do!! You might be surprised. If you have any familiarity at all with SharePoint you have been bombarded with this word ‘Governance’. A Google search of SharePoint Governance returns 1,040,000 results. Maybe it should be something we should pay attention to? At its most simple, governance is a set of rules your organization puts in place to make sure your SharePoint deployment is being used properly. Entire books have been written on the subject. People specialize in it and present on it. Luckily there are a lot of great resources and gurus out there that you can talk to to make sure your have a proper Governance strategy. Joel Oleson and Paul Culmsee are always great resources to check with when wrapping your head around SharePoint Governance. When it comes down to it, you need at least a governance committee and documented governance standards. What are you going to put on your farm? Where are you going to put it? How are people going to be authenticated? How many Web Applications are you going to need? How about 2 years from now? How you plan and develop your farm’s taxonomy and logical architecture is critical to the ability to be able to expand in the future as well as have a location where you want new sites to exist. If you don’t get this one right your SharePoint environment can turn into your current file share or eRoom. It will become a total mess and completely unusable. 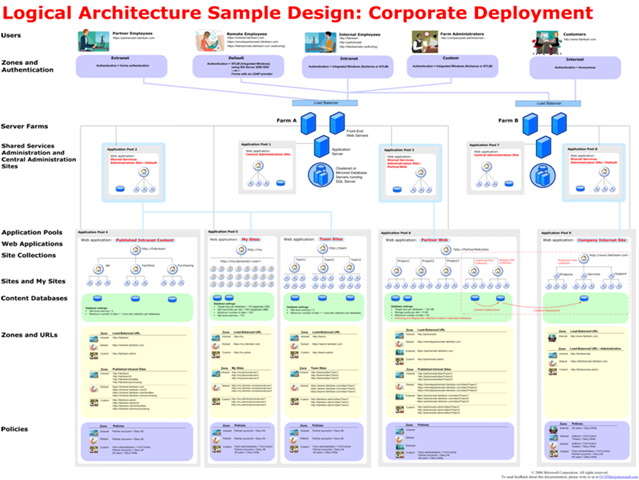 I think technet has a great article called “Logical architecture model: Corporate deployment” with a link to a sample design (shown below). It helps you gain a much better understanding of the structure of SharePoint and how everything is connected. Plan to devote some time to the exercise, but when you come out of it you truly have a better understanding of your farm. So, is there any reason why you have a single server farm in production? Can you really not afford a multiple server farm? Don’t skimp on hardware if at all possible. I’m not an expert here on what YOU should do.Personal opinion is that you shouldn’t have less than a three server farm to begin with if you plan to use SharePoint (1 WFE, 1 APP, 1 SQL). With this structure you can easily add additional servers where needed with little impact. I’ll not say more on the subject and risk chastisement from those who specialize in this sort of nonsense. Why anyone would want to make a living on hardware is beyond me! If you have a talented SharePoint Administrator you know they are worth their weight in gold. They keep everything running smoothly, track down those periodic performance hiccups, apply those ever-so-important service packs, help make sure users have the access they need, and are critical to your future site deployments. You cannot have a successful deployment without one. If you don’t have one, get one. If you have one, give them a raise right now and thank them for all they do. Okay, some people may not agree with me on this one. It seems the norm for most organizations is to bring consultants who are SharePoint Architects to help design and initially deploy a SharePoint Farm. This is all well in good if you never add anything to your farm that doesn’t quite fit into your taxonomy, or expand upon your original plans for SharePoint, or need to guide junior SharePoint developers, or meet with your business to discuss how SharePoint can best benefit them, or have a go-to person for all your SharePoint questions. Think of a SharePoint Architect as the Ring Leader in the SharePoint Circus. In short, a SharePoint Architect keeps the projects moving, looks out for potential problems, and has an eye on the future. I totally believe that a SharePoint Architect is critical to continued growth and success of your SharePoint deployment. Will we use SharePoint Designer? If we do you SharePoint Designer, who will we allow to use it? Are we going to allow custom development (Visual Studio)? Are we going to allow ANY custom code on our farms (including 3rd party web parts)? How are we going to deploy custom code? Do we have development environments for our developers? The answers for each of these vary greatly depending on what type of organization you are in. Find out up front what you are going to be able to do within yours. So, I say time and time again that you cannot be successful in SharePoint without some involvement in the SharePoint community. SharePoint is such a huge beast and there is so much BAD information out there that you can’t rely on Google to solve all your problems. You need to have a lifeline that you can get the best answers from. You need to be able to talk to those people who have fought the same fights, bled the same blood, and have loathed SharePoint with every fiber of their being at some point. Only then will you get the right help and the best help. Because of the SharePoint Community, my worth to my company is that of an expert SharePoint Architect, Developer, Admin, Branding guru, and any other SharePoint role you can think of. Plus! Because of the community I ALWAYS know of problems with SharePoint Service Packs BEFORE they impact my organization. That’s worth its weight in gold right there.. assuming it had physical weight.. which would be great… I assure you my friend. You can have the most handy-dandy, super-duper SharePoint deployment since the dawn of time. You can have it running on the best hardware known to mortal man and employ a fleet of SharePoint MVP’s that would make James T. Kirk blush. You can be prepared for every conceivable scenario and be a diamond partner at every SharePoint Conference, BUT without End User Adoption what good is it? One of the best presentations I ever saw on the subject came from Tiffany Songvilay. She suggests having large, exciting kick-off events to introduce users to SharePoint and show them all the great benefits they get from using SharePoint. Get them excited about using it instead of just pushing it on them. She also suggests things like special speakers for these kick-off events and door prizes to encourage participation. All good stuff. Remember how much you hated SharePoint at first? Remember when it made your head hurt just to look at the screens? Remember how frustrated you were trying to learn it and do ANYTHING? What the heck IS SharePoint anyway? And you are supposed to be the smart one!! Imagine how these end users feel when they get this thing called SharePoint dropped in their lap with no understanding what it is how or how to use it! Invest in training your end users. BELIEVE ME your SharePoint Admins will appreciate it almost as much as the end users. Remember, SharePoint is supposed to make life easier for your end users, not harder. Help your end users succeed and your SharePoint Deployment can succeed. When it comes down to it, you need time. Give yourself time to wrap your head around SharePoint and all of this crazy mess. You aren’t going to understand it overnight. You might not even understand it in 6 months. Give yourself a year. Plan everything out. Once you have an idea of what SharePoint is, plan your goals for SharePoint. Design everything out. Pictures help. Make sure you have all the pieces in place and then execute. Be wary of any consulting firm that says they can come in and stand SharePoint up in two months. Sure, they can stand something up, but I doubt it will meet your needs and you’ll probably end up rebuilding it anyway. SharePoint can either be your crowing glory or your Achilles' heel, a gold star on your resume, or a black eye that will relegate you to the depths of customer support. Hopefully I’ve helped identify some needs in your organization, confirmed that you are on the right track,or just wasted precious moments of your life that you will never get back. But I ask you this, if you disagree, what requirements do YOU find critical for success in your SharePoint deployment? Not just for today, but for tomorrow as well. Thanks for the shout out, Hillbilly. Great list. SharePoint is a perfect opportunity to implement other new things, like taxonomy and governance, but as you know SharePoint will get blamed for the growing pains of any other change a company implements. Like you said, there's more than 10 things, but thinking through these helps bring up all the right questions. Great post Mark! Definitely a good starting point as many organizations forget that a successful IT project requires more focus on end users then on technology (assuming they have a solid understanding of the technology). I'd also love to look at Tiffany's powerpoint presentation. Yup, all good points, and I totally agree with you that number 1 is Time. I've seen too many 'We want a SharePoint System in 4 weeks' type projects this past 18 months.